We buy junk cars, vans, SUVs, and trucks and pay cash in South Carolina! You'll be paid right on the spot by one of our awesome South Carolina junk car buyers. South Carolina is perhaps best known for it’s gorgeous beaches and tasty peaches. It also holds major historical significance for southern and confederate culture. In fact, the American Civil War was started at Fort Sumter. Even though it shares a name with its neighbor to the North, South Carolina has a distinct and unique culture of its own. At The Clunker Junker, we often get grouped together with our competitors, but we like to think we are unique as well. Not only do we pay more cash for cars in South Carolina than anyone else, but we are proud of our reputation as the number one junk car buyer in the state. We earned that distinction by paying top dollar for junk cars and providing unmatched customer service. Want to see for yourself? Check out our many positive online reviews. We buy junk cars in South Carolina whether the vehicle was involved in an accident, has a blown engine, or is just sitting around collecting dust in your driveway. As long as the vehicle is complete, we will usually be able to make an instant offer on the vehicle. But do you know what the best part is? When you sell your junk car to us, we always include free towing and removal. Many South Carolina auto salvage yards will give you a price, but then expect you to pay to tow your car to them! Always watch out for the fine print. From historical Charleston, to the capital city of Columbia, to Greenville in the west, we have helped thousands of South Carolinians sell their junk and used cars all across South Carolina and get the most money for them in the process. When you’re looking to get rid of your junk car, you could try and feed it to “Messie” in Lake Murray, but there is an easier way: Call The Clunker Junker today and we’ll pay cash for junk cars in South Carolina without any of the hassles associated with trying to sell it privately. Don’t drive your Junker into the Black River Swamp or hassle with the auto salvage yards, instead, check us out! You can sell your junk car in South Carolina easily by following our easy three-step process to get top dollar for your junk cars. Even if your car looks like it could be a relic from the Civil War, don't worry. 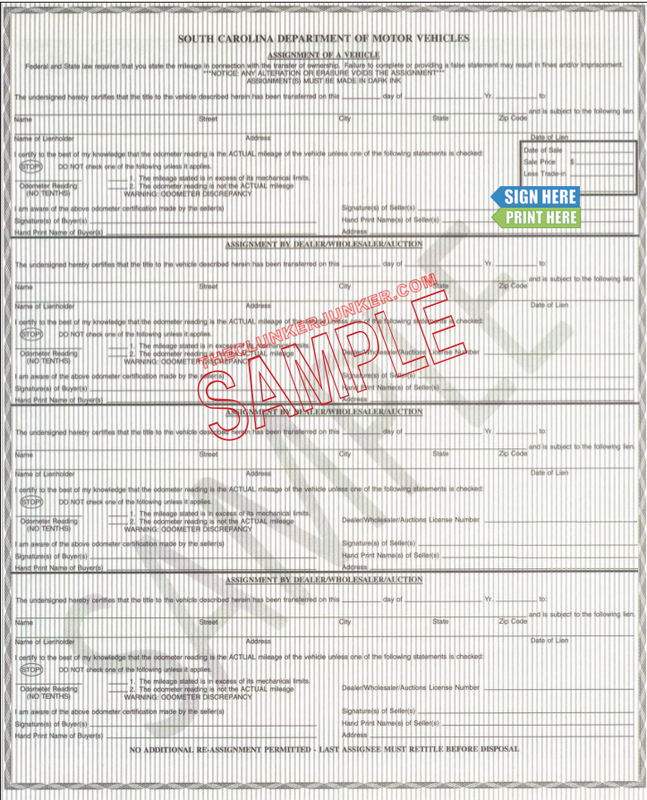 Start with the form at the top of the page and fill in your make, model, year, and the condition of your vehicle with any ownership documents. We can pay cash for junk cars with no title in some cases, but your car must be older than 2004 and can prove legal ownership. We stand out from other South Carolina junk car buyers by giving you a free instant cash offer! We work with the best professional junk car buyers across the Palmetto State, so you can be sure you're getting the most cash for your car in South Carolina. Our junk care removal service is free and flexible to your schedule. We will need details like the full name listed on the title, location and color of the vehicle, and the VIN. We must be notified if the title is missing. Once set up, our junk car buyer will reach to find the best time for you. They'll pay you either cash or check right on the spot and haul the vehicle away for free. How much will I get when I sell a junk car in South Carolina? The bottom line is we will buy your junk car for cash, but each car has a different value based on its condition, age, if it can run and if there’s a title involved. These three groups help categorize your junk car you’re trying to sell. These cars don’t run, are missing parts, and typically become rusted piles of scrap. These are typically crushed and sold to salvage yards, prices are dependent on size and weight. South Carolina has one of the worst scrap markets in the country, so offers can be as low as $35 with pickup included. These cars may have parts that can be salvaged, then crushed for scrap metal. Typically, we pay a little more for these types of cars depending on your location. Salvaging individual parts is more lucrative over the long run then raw materials alone. We buy a large assortment of cars, even nicer cars. These cars are usually a bit newer and can drive without too many issues, and we pay much more for them. Prices are dependent on condition and comparable auction sale prices. This group has a huge range from $100 to $10,000 or more. 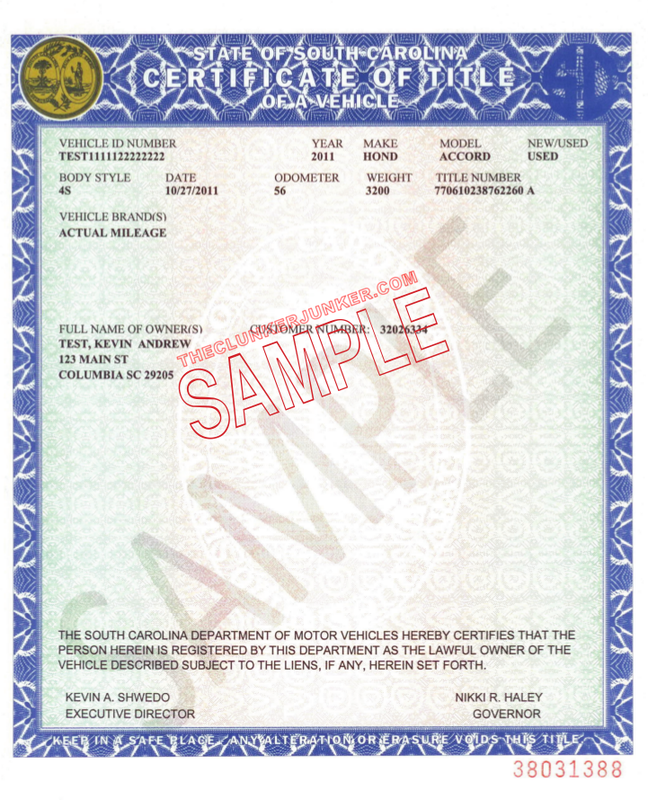 We have put together a simple guide and example for how to sign your South Carolina title when you are selling your vehicle. If there are multiple owners listed on the title, they must all sign the title unless the names are separated with "OR". When signing your South Carolina title, make sure you use the section on the back that says "Assignment of a vehicle" towards the top. Never sign or write anything in the sections that say "Assignment by dealer/wholesaler/auction" as this will make your title void. 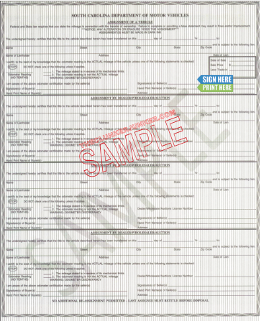 Complete the Lost/Stolen or Destroyed Certificate of Title Report. Fill out the South Carolina Application for Certificate of Title and Registration for Motor Vehicle. Please note that may be a waiting period before a duplicate title can be issued and the cost is $15.00. You can pay an additional $20.00 for expedited processing. Getting rid of an abandoned vehicle in South Carolina can be a difficult process. Unfortunately, you cannot just sell any junk car that ends up on your property if you do not own it. You'll need to follow the South Carolina abandoned vehicle removal procedures. We have given a general overview of what that entails below. You may not apply for the title to an abandoned vehicle, however if the last registered owner and/or lienholder do not step forward to claim interest in the vehicle, it will be sold at public auction. Can you buy my car in North Carolina if I do not have the title? In some cases, yes we can. Your vehicle will have to be older than 2004 and you’ll need to be able to prove you are the legal owner of the vehicle. The carrier will ask you for a valid photo ID that matches your current registration and or insurance card. Also, your offer may be much lower if you don’t have a title as resale options are more limited. South Carolina often changes their title documents from year to year. If you have questions about your specific title, please contact your South Carolina DMV. Complete the notice of vehicle sold form and return it to your local DMV office. We give price estimates instantly, provide amazing customer service, and offer free pick up at convenient times. Why wait any longer? It’s time to get in touch with us to get rid of that scrap pile. We give the most cash for junk cars in South Carolina! "I recently had an inspection after the check engine light came on, and the cost of repairs were too much at this time. The brakes and fuel injector need to be replaced. " "It recently started running hot on us, and we were tired of hassling with it. We recently put a new water pump, thermostat and radiator in it. We decided to just get a new vehicle." "The vehicle is missing the front seat belts, there's no radio and no A/C. The brake pads are brand new at only one month old. The two back tires are brand new as well at only one week old. The transmission blew." "The vehicle has no A/C, no radio and no front seat belts. The transmission blew. The car starts but won't go beyond first gear, and it has a hard time in reverse. The brake pads are brand new. They were replaced a month ago along with the rear right axle. The two back tires are brand new as well and are only one week old." "The vehicle is missing the passenger-side door, mirror, and the factory radio is not put in place. It got water in the oil during the flood on 5/16/2016. It doesn't start, but the lights and everything turn on." "I work for a repossession company. We're trying to see what kind of cash offers we can get out of the junkers that we have stored at our lots. We need to get rid of them. " The Clunker Junker is one of the top junk car buyers in the state of South Carolina. To date we have made instant offers on over 30 thousand vehicles across the state, totaling over $6.5 Million offered! Of those vehicles, approximately 9% were purchased without a title. We also buy cars on a wide spectrum of conditions and 60% of the vehicles we've made offers on in South Carolina do not start or drive. Many also have moderate to severe body damage. Columbia in Houston County was our top producer, followed by Greenville.